Omni Tanker has in house capabilities including product development, production and engineering. This enables us to create high quality solutions with fast response times. Innovation the heart of what we do. We develop products from a thought or desire in someone’s mind, through to a one-off bespoke build or serial production of units. Highly experienced project managers ensure high quality outcomes for engineered structures, on-time and to budget. The development toolbox is a combination of the engineering and manufacture capabilities, and our ability to organise this into a successful outcome. Integration of all aspects of the design, analysis and engineering know-how, then casting the real world eye over the structure, to get the structures working as customers intend. Our engineering and production capabilities allow us to make all prototypes in house. In addition to our standard product high performance liners, we have the capability of producing liners with dimensions of up to 10 metres long and 3.5 metres wide. Regularly used manufacture techniques include wet layup, vacuum bag resin infusion, and filament winding. In house fabrication is used for manufacture of tank to truck mounting skids and supports, capital equipment and other bespoke builds. An important aspect of dangerous goods, as well as regular liquid cargo transport, is fit out of tank values and connectors, tailored to interfacing requirements of customers. Our engineering and production staff work under a quality management system, to ensure products meet all requirements. CAD modelling, allowing fast product realisation, assessment, design and drafting of high complexity structures. 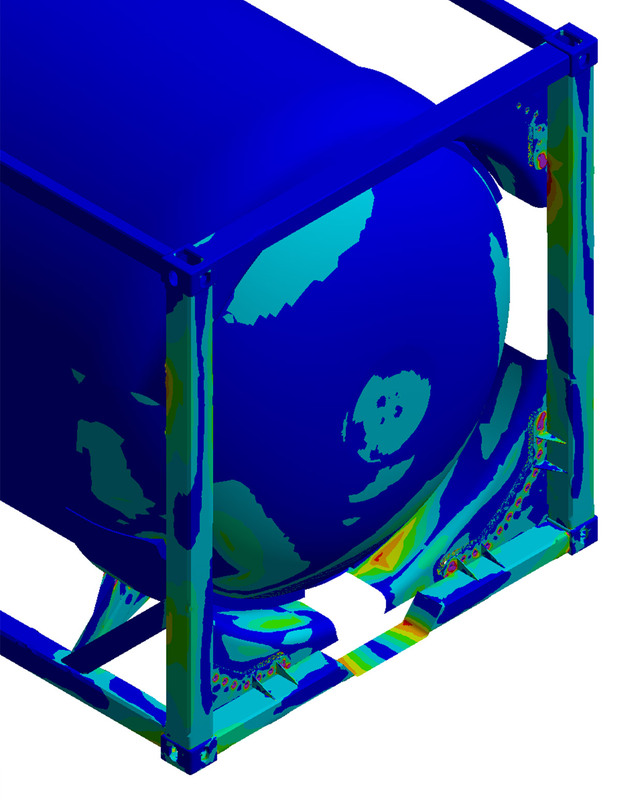 FEA to reduce product development times, optimise our structures for lowest stress and mass, and ensure high integrity structures with failure analysis predictions. Other specialised analyses are undertaken on request. A high level of experience practical knowledge of how tanks and composites work, at the microscopic and structural levels, and how to manufacture them. Capacity to design and undertake small to large scale experiments on materials and structures with all required instrumentation. Dangerous goods tankers generally require an approval from a government authority to enter service. We retain capability to write such approvals for submission to authorities.